The Scottish based creative duo of Rob Hall & Chick Lyall has been developing its musical language and identity since around 2003. Their music is informed by a very wide range of genres from Baroque chamber music to free Jazz and folk idioms, connecting with the broader European music tradition though often articulated with an American attitude. The central thread through all their performance work is the intense musical dialogue that they are able to build between them. Though the duo is now performing internationally at festivals and a wide array of arts venues, the formation of this musical relationship began rather more inconspicuously through monthly gigs playing jazz standards at a rural hotel in the Scottish Borders. As active members of the Scottish jazz scene the two had met previously playing as sidemen in other groups and in each others bands. Quickly discovering a mutual empathy for classical music as well as jazz, the duo begun to build a touring schedule which has included concerts of chamber music, some in collaboration with Scottish cellist Robin Mason, and performances of their own music in jazz venues, music clubs, festivals, arts centres and churches. An enquiring interest in composition has been a driving force and the duo particularly explores the ground between improvisation and composition. They can deliver pure improvisations that sound composed and equally their own compositions are interpreted and renewed through the use of improvisation. For both musicians the duo has become in recent times their central creative vehicle and a true collaboration. The duo has released three CD recordings to date for the FMR label with virtually unanimous applause from the music press throughout. Having laid out their broad musical canvas with The Beaten Path (2005), their second release Rhyme or Reason (2009), backed by the Scottish Arts Council (now Creative Scotland), followed suit very strongly, incorporating both fully improvised and fully composed material into the programme. Their 3rd recording Blithe Spirit (2011), launched at the Edinburgh Jazz Festival with a linked concert in Atina, Italy, saw the duo interacting with electronic backdrops alongside acoustic playing. Chronicles (2013) represents a new direction for the duo with live electronics and bass clarinet incorporated into the sonic fabric, with a true symbiosis of improvisation and composition. Their music has been broadcast nationally on BBC Radio 3 and they have appeared several times on BBC Radio Scotland both in live performance and interview. Rob has performed/recorded with Mike Stern, Danny Gottlieb, Kenny Wheeler, Jim Mullen, Simon Thoumire Orchestra, Anne Martin, BBC Scottish Symphony Orchestra, Paragon Ensemble Scotland and many others. Festival appearances include Bath, Cheltenham, Glastonbury Jazz Stage, Celtic Connections, Liverpool and Edinburgh International Festival. In 2001 the Highland Festival commissioned Rob to collaborate with two of Scotland’s leading visual artists to produce A Highland Canvas. 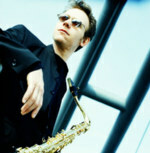 He has released three Cd recordings as a leader for the FMR contemporary/improvised label. Chick Lyall is a founder member of the acclaimed Green Room Trio and has recorded three albums under his own name, the most recent with Swedish saxophonist Joachim Milder. He has undertaken many commissions, which include works written for the Scottish Chamber Orchestra, Scottish Jazz Composers Orchestra and numerous small scale works, and in 2004 he was awarded the prestigious Creative Scotland Award to develop a work for two pianos. He has also written scores for film, dance ensembles and has performed as solo harpsichordist in recitals of Bach, Handel and Scarlatti.